Holmgren, Eric J.. "Ralph Garvin Steinhauer". The Canadian Encyclopedia, 01 June 2017, Historica Canada. https://www.thecanadianencyclopedia.ca/en/article/ralph-garvin-steinhauer. Accessed 20 April 2019. ​Ralph Garvin Steinhauer, OC, lieutenant-governor of Alberta, Indigenous leader, farmer (born 8 June 1905 in Morley, North-West Territories [now AB]; died 19 September 1987 in Edmonton, AB). The first Indigenous person to serve as lieutenant-governor of a Canadian province, he was committed to Indigenous affairs in Alberta and Canada. Steinhauer was the 10th Lieutenant Governor of Alberta (2 July 1974 to 18 October 1979). 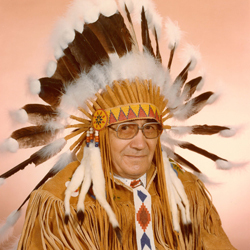 Ralph Garvin Steinhauer, OC, lieutenant-governor of Alberta, Indigenous leader, farmer (born 8 June 1905 in Morley, North-West Territories [now AB]; died 19 September 1987 in Edmonton, AB). The first Indigenous person to serve as lieutenant-governor of a Canadian province, he was committed to Indigenous affairs in Alberta and Canada. Steinhauer was born to Josiah Apow and Amelia Mildred Mumford on 8 June 1905. His father died when he was a young boy. Steinhauer’s mother eventually remarried, and her husband, James Arthur Steinhauer, adopted her children. A Treaty Indian of Cree descent (see Indigenous Peoples: Treaties), Steinhauer was raised a member of the United Church of Canada. His adopted father was the grandson of the famous Methodist missionary Henry Bird Steinhauer. Growing up, Steinhauer attended Brandon Indian Residential School in Manitoba (see Residential Schools). On 20 November 1928, Steinhauer married Isabel Florence Margaret Davidson. They had five children together: Muriel Ann, Doreen Margaret, Kathleen Amelia Jean, Isabel June and Kenneth Davidson. Steinhauer began his career a farmer. He operated a farmstead near Brosseau, Alberta, on what is now Saddle Lake Cree Nation (see Reserves). He joined the United Farmers of Alberta in 1923 and was a founding member of the Alberta Wheat Pool and district president of the Farmers' Union. Dedicated to his community, Steinhauer helped launch a successful farming venture — the Saddle Lake Centennial Development Association — on his home reserve. He was also a member of a variety of Indigenous business and development associations including the Alberta Indian Development Systems Limited (president), Brosseau Mutual Telephone System (member of the board of directors), Northern Alberta Development Council (council member), Indian-Eskimo Association, Rural Electrification Association, Alberta Rural Development Authority and Federal Indian Economic Development Authority. Steinhauer was a vocal supporter of Indigenous rights. As a young man, he was denied a position as an assistant postmaster on account of his ethnicity. He was also a survivor of the residential school system. His experiences motivated him to become involved in Indigenous rights organizations. Steinhauer founded and was president of the Indian Association of Alberta. He also served as councillor and chief of Saddle Lake Cree Nation. During his time as lieutenant-governor, Steinhauer spoke out about Indigenous issues. On 23 January 1975, Steinhauer read the Speech from the Throne in full regalia, highlighting the historic and complex relationship between Canada and Indigenous peoples. In 1963, he ran as a Liberal candidate in the federal election, but was defeated. Eleven years later, Prime Minister Pierre Elliott Trudeau asked Steinhauer if he would accept a nomination as the lieutenant-governor of Alberta. Not familiar with government protocol, Steinhauer was initially hesitant to accept the position. After discussing it with his family, however, Steinhauer fully appreciated the honour of the offer and accepted. On 2 July 1974, he was sworn in as the lieutenant-governor of Alberta. Steinhauer received the Canadian Centennial Medal (1967), the Officer of the Order of Canada (1972) and was a Knight of Grace of the Most Venerable Order of the Hospital of St. John of Jerusalem (1975). He also received honorary doctorates in divinity from St. Stephen's College, Edmonton (1985) and in law from the University of Alberta (1976) and the University of Calgary (1979).